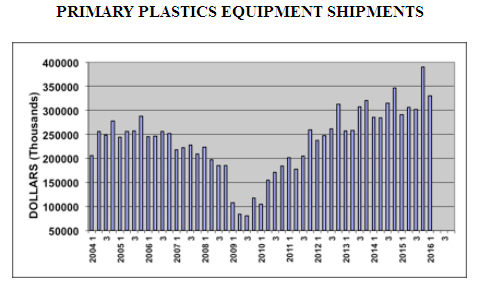 For the second straight quarter, North American shipments of plastics machinery registered a strong year-over-year increase in Q1 of 2016 according to statistics compiled and reported by the SPI: The Plastics Industry Trade Association’s Committee on Equipment Statistics (CES). Shipments of primary plastics equipment (injection moulding, extrusion, and blow moulding equipment) for reporting companies totaled US$330.5 million in the first quarter. This was 13.5% higher than the total of US$291.2 million in Q1 of 2015. This total was 15.4% less than the US$390.6 million from Q4 of 2015; however, this data is not seasonally adjusted and the fourth quarter is typically the strongest quarter of the year. “This year got off to a good start. There has been a strong upward trend in the machinery data since the recession hit bottom in 2009, but this trend hit a plateau during the first three quarters of 2015. It re-emerged in the fourth quarter of last year, and the momentum was sustained in the first quarter of this year,” according to Bill Wood, of Mountaintop Economics & Research, Inc. Wood is the plastics market economist who analyzes and reports on the plastics machinery market for the CES. When this data is broken out by reporting sector, there was wide variance in the quarterly totals. The shipments value of injection moulding machinery jumped 25.2% in Q1 of this year when compared with the total from Q1 of 2015. The shipments value of single-screw extruders decreased 17.4% in Q1 when compared with Q1 of 2015. The shipments value of twin-screw extruders (which includes both co-rotating and counter-rotating machines) escalated 6.8% in Q1 when compared with the same quarter last year. The shipments value of blow moulding machines dropped 63.5 percent in Q1when compared with Q1 of 2015. New bookings of auxiliary equipment for reporting companies totalled US$120.1 million dollars in Q1 of 2016. This represented a jump of 13.6% over the total from Q1 of 2015, and it was a decline of only 5.2% when compared with the seasonally-strong total from Q4 of last year. The trend upward in the CES data corresponds with the long-term trends in the two major data series compiled by the US government that measure overall demand for industrial machinery. According to the Bureau of Economic Analysis, business investment in industrial equipment escalated 6.3% (seasonally-adjusted, annualized rate) in Q1 of 2016 when compared with Q1 of 2015. This follows a gain of 6.5% in the fourth quarter of last year. According to data compiled by the Census Bureau, the total value for new orders of industrial machinery jumped 21% in Q1 of 2016 when compared with the total from Q1 of 2015. This gain followed a rise of 12.1% in Q4 of 2015. "After a sluggish start to the year, the recovery in the US economy will gain momentum as 2016 progresses. This will spur rising consumer demand for plastics products. On a macroeconomic level, interest rates are expected to increase gradually in the coming months, and there will likely be a moderate rise in the price of energy products. But these two trends will be mitigated by a rise in wages and household incomes resulting from stronger employment levels," said Wood. The CES also conducts a quarterly survey of plastics machinery suppliers that asks about present market conditions and expectations for the future. According to the Q1 survey, 84% of respondents expect market conditions to either hold steady or get better during the next 12 months. This is a small improvement in expectations from the previous quarter. The outlook for global market conditions also improved in the first quarter. North America is now expected to have the fastest market growth in the coming months, but the outlook for Mexico is also strong. The outlooks for Asia, Europe, and Latin America improved in the first quarter when compared with previous quarters, though they remain well below the levels expected for North America and Mexico. 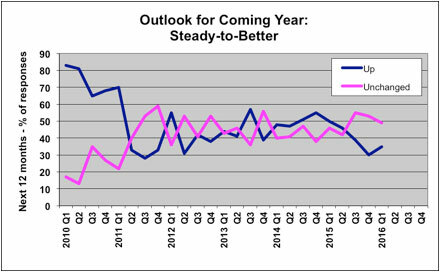 As for the major end-markets, the respondents to the Q1 survey expect that medical, autos, and packaging will enjoy the strongest growth in demand for plastics products and equipment this year. Expectations for all other end-markets call for steady-to-better demand to prevail in 2016.